Food waste is created in Singapore every single day from our food cycle – production, distribution, retail to consumption, and the wastage is unfortunately due to several reasons, such as food spoilage due to improper storage or handling, edible food thrown away because it does not look nice or has ‘expired’, food discards or leftovers during cooking and when we can’t finish our food, etc. Food waste is generated from our farms, food manufacturers, food distributors, food retailers, wet markets, supermarkets, hawker centres, restaurants, food courts, caterers, and our homes. 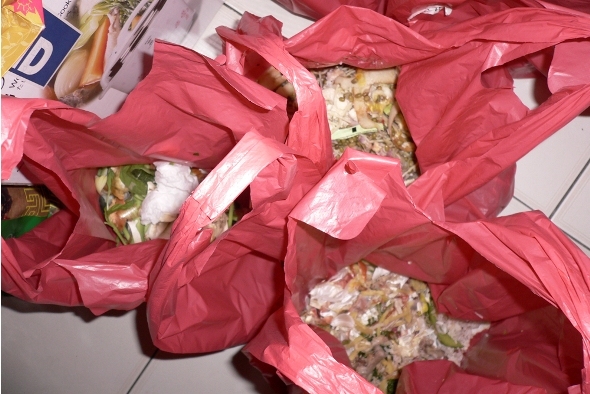 In fact, Singapore threw away about 0.68 million tonnes of food waste in 2011 and only 10% was recycled. This means on average, each person in Singapore generated about 130kg of food waste a year. The recycling rate for food waste has dropped from 16% in 2010 to 10% in 2011. Without any campaigns by the National Environment Agency (NEA) to reduce or recycle food waste, the food waste recycling rate would remain low over the next few years, and NEA is likely to miss its target of 30% recycling rate for food waste by 2012, set in the Singapore Green Plan 2012. Singapore’s food waste output of 0.68 million tonnes is the only official figure published by NEA, and unfortunately it does not explain what the food waste comprises and where it comes from. In addition, supermarkets, food manufacturers, and food outlets are not forthcoming in divulging how much food waste they generate. Cosmetic filtering occurs in farms, wholesale and wet markets, supermarkets to homes, where food that looks “ugly”, damaged or less than perfect according to market or personal standards are discarded even if it’s edible. 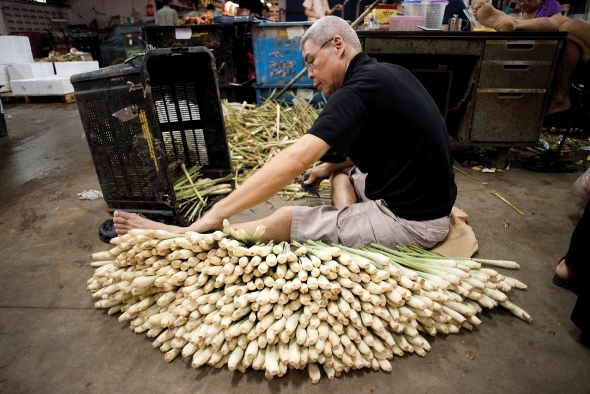 Every day, 250 vegetable sellers at the market spend dusk to dawn trimming, preening and discarding “ugly” vegetables to prepare them for sale to hawkers and wet market sellers. The criteria: vegetables must be free of pest marks, be in the right shade of colour and not look too ripe. “Of course I’ve to make my vegetables look nice. If not, who will buy them?” says stall owner Albert Li, 60. He estimates about one-third of all vegetables at the wholesale market get thrown away for not meeting the mark. Based on our observations at food waste recycling company IUT Global, the market discards up to 30,000 kilos of unwanted vegetable parts and blemished fruits every day. Once fresh produce show the slightest defects or are deemed unsellable by supermarket staff, they will be thrown away. Most often, vegetables and fruits form the bulk of the unsellable fresh produce due to their perishable nature. This constitutes 10 to 15 per cent of the total fresh produce stock at Sheng Siong, says its managing director Lim Hock Chee, 50. 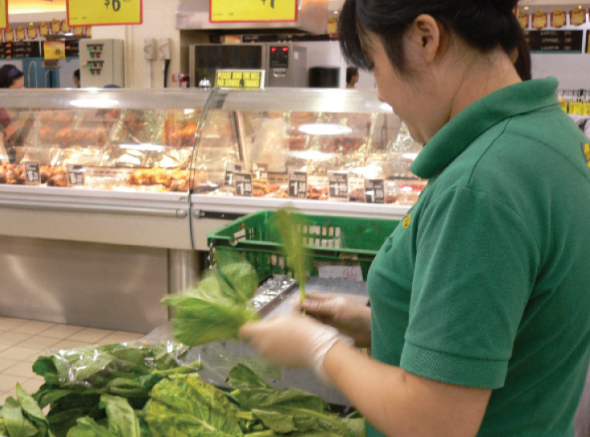 Food suppliers are expected to clear their goods at least one week before their stated expiry dates, according to Mr Ang. These goods are usually brought back to their warehouse to be resold to food establishments or manufacturers. The leftovers are dumped. Food wastage occurs in food stalls and restaurants when staff and chefs are not properly trained or managed resulting in badly cooked food, or when chefs don’t see the need to cook less and save money for the boss. In addition, improper inventory management where chefs order more instead of less to play safe, also results in food wastage. 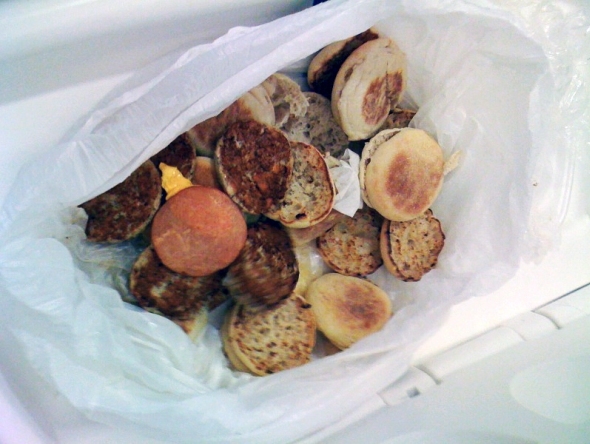 But when the cakes and bread are unsold, it is common for the food to be thrown away at the end of the day. Food From The Heart, a voluntary welfare organisation that channels unwanted bread from hotels and bakeries to needy families and individuals, collects approximately $150,000 worth of unsold bread and buns monthly. The volume of bread collected fills up around 900 supermarket trolleys. 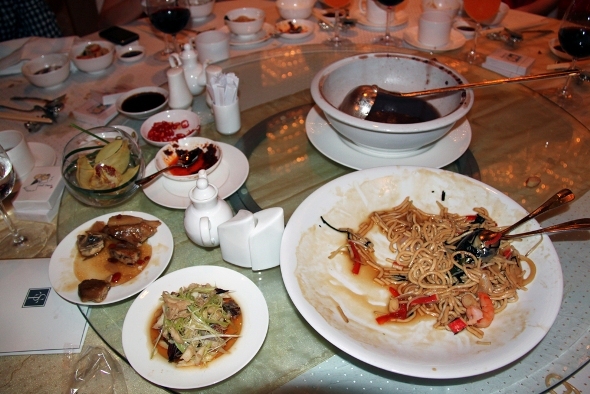 Asians tend to provide an abundance of food to guests, and at social or festive events such as wedding banquets and annual dinner and dance events, it is common to see guests unable to finish the eight or nine-course dinner, and thus wasting food. It is also common to see food waste at buffets, where the all-you-can-eat concept see customers take more food than they can finish. The students found that at least 10 to 20% of prepared food goes to waste. When guests or customers at restaurants can’t finish their food and there are leftovers, some people find it embarrassing to doggie-bag the food as the practice is seen to go against social norms. The students conducted a study on household waste in Singapore by collecting a day’s worth of food waste from 150 families staying in HDB flats, condominiums and landed property. The results show that fruit peels, vegetable parts, eggshells, bones and leftovers like rice and gravy formed the bulk of the waste, and the average household food waste per person was 126g. In another survey of 174 Singapore residents, the students found that six in ten would buy more than what they need when shopping at supermarkets. This could lead to overstocking of food at home and the food could end up not being consumed and expire. The survey also show that 70% would throw away food that has been slightly expired by one to three days, even though it is still edible. I think that it is our duty to recycle and not to allow so much food go to waste. There are still countries where people have nothing to eat and it is a real shame that we throw away so much food. Something should be done, some kind of a system, especially for the restaurants where the food waste is a huge amount. what happens to the food waste? will it be burned or smth? Bring all your food waste to one of the bins of Foodbank.sg, for e.g. at CitySquare Mall (next to the Farrer Park MRT), 2nd floor. There are bins to donate your food items. Thanks! I think you Singaporean have to start opening your mindset. Why feel shy about doggie-bagging food. You should feel ashamed for wasting FOOD. There are thousands people in world who are starving to death and you guys are just like, “Oh, there’s too much food. Let’s just throw it.” Seriously? Consider well about this.